It may not have been the muscle car a purist would have conjured up, but the 1969 Ford Talladega was on a special mission of its own. Produced for just a few short weeks in 1969, it went on to dominant success on NASCAR tracks around the country. Ford spent a lot of the 1960s and early 1970s watching the taillights of quicker MOPAR and GM muscle car rivals. But in NASCAR, the forces from Dearborn were consistent front-runners. 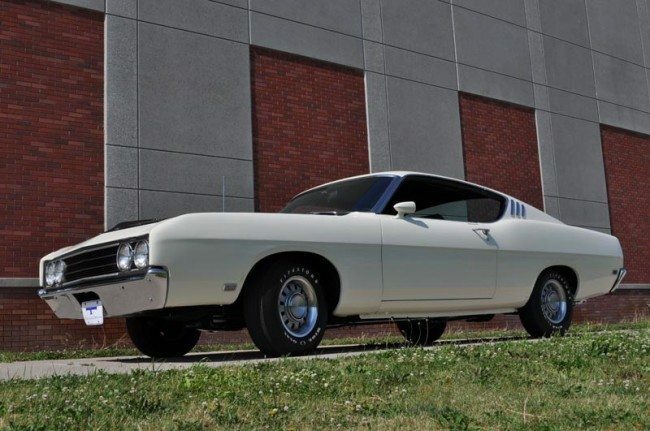 For ’69, their new machine was so hot that even superstar Richard Petty defected from Plymouth to drive it. It was called the Talladega, after NASCAR’s newest superspeedway. This was Ford’s answer to Dodge’s wind-tunnel wonder, the Charger 500, and as required of Dodge, Ford built street versions to qualify it for racing. The Talladega was based on the 1969 Fairlane Cobra Sportsroof, but with some vital aerodynamic differences. The nose was tapered and stretched by five inches, and a flush-mounted grille replaced the recessed production unit. The front bumper was actually a Fairlane rear bumper narrowed to fit. Holman and Moody figured out that by sectioning them in the middle, it made them tuck in closer to the body to catch less passing air and act as an old school spoiler for the front end. One critical change that many observers never notice is the modification to the rocker panels. They were re-rolled to provide a shallower rocker panel. To determine how low a car could be during the race track inspection process, NASCAR measured the rocker panels from the bottom edge. Due to the re-rolled rocker panels these cars could now sit 1” closer to the track without violating NASCAR’s ride-height requirements. NASCAR versions ran Ford’s 427 cubic inch V8, then switched to the Boss 429. Street Talladegas used the 335 bhp 428 Cobra Jet with a column shift automatic. None had ram air, but all got a Drag Pack oil cooler and disc brakes. Cobra-issue bench-seat interiors were used, and it is believed all the production cars received AM radios. The Talladega did exactly what Ford hoped it would do on the racing circuit: it won 29 Grand National races during the 1969 and 1970 NASCAR seasons – far more than any other model, and David Pearson also won his third NASCAR Driver’s Championship with a Talladega. Ford’s aero warriors trounced the Charger 500 for the season, winning 30 races, including eight by Petty, bringing Ford the ’69 NASCAR Championship. 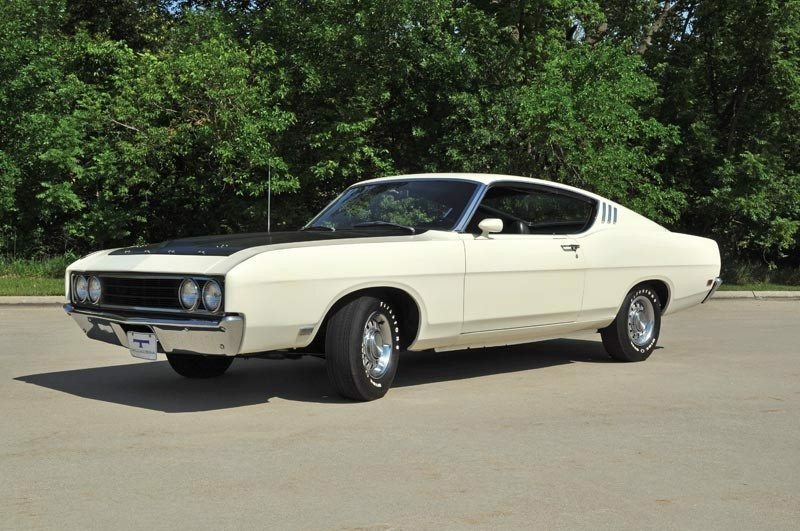 When the King Cobra version of the redesigned ’70 Torino disappointed in early testing, the ’69 Talladegas and Spoiler IIs were retained for NASCAR’s 1970 season. Petty had been lured back to Plymouth by its radical new Superbird, and the title returned to Chrysler. But Ford had produced a real winner, and by happy necessity, a unique members of the muscle fraternity, and today, a highly collectible piece of history. 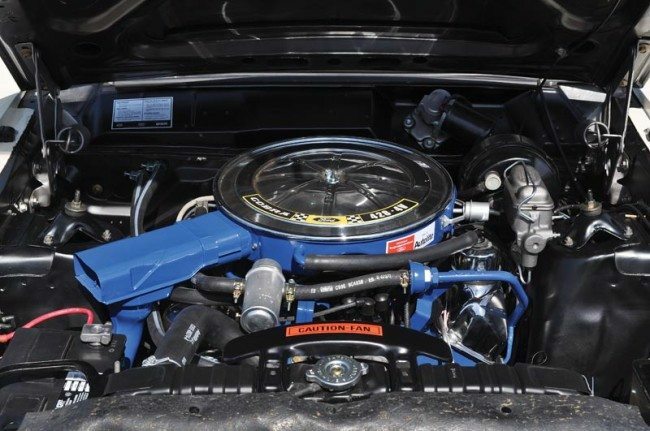 This great Talladega is one of the luckiest survivors of all of the 748 production cars, with its date coded Cobra Jet engine intact, original transmission and rear end in place, and retaining it’s all original Ford sheet metal. It was recently repainted to factory correct standards in Wimbledon White, and it appears today just as it left Dearborn. The interior is original, and no less than four factory build sheets accompany the car. 1969 would prove to be the last year of factory involvement in racing for Ford, simply making these rare Talladegas all the more desirable.